In a large saucepan or pot, melt 2 knobs of butter and a pinch of salt in 2 tablespoons of olive oil and gently your onions/shallots on a gentle/medium heat for 6-8 minutes so that they become translucent without taking on any colour. Once cooked, pour in your risotto rice and give the grains a good stir so that each granule is coated in the oil. Turn up the heat to medium high and your white wine. Keep stirring the rice until the white wine has been completely absorbed and add one small ladle of chicken stock. For the next 25-30 minutes, keep stirring your risotto continually while adding one small ladle of stock every few minutes or whenever the grains have absorbed all the stock. Five minutes before your risotto’s cooked, heat the remaining butter and olive oil in another pan and toss in all your vegetables. Stir fry these for 2 minutes and add the lemon juice. Pour all the vegetables (and the saucepan’s butter/olive oil that your vegetables cooked in) into your risotto and give it a final stir. 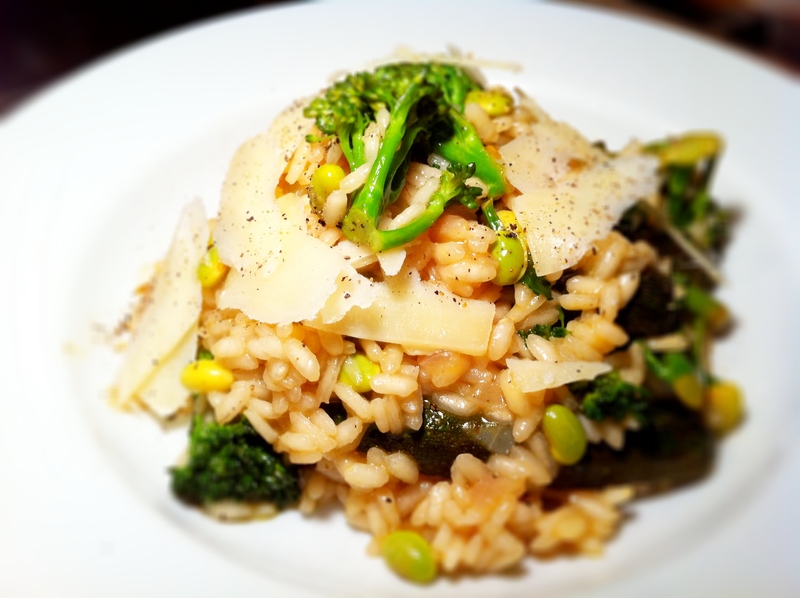 To serve your risotto verde, grate or shave some parmesan over the top, along with a generous grind of black pepper. If you like, squeeze a little bit more lemon juice over the top before grabbing a fork and digging in.